Anyway, back to my earlier question. what do people expect of a national park? Me, if I were a visitor to the Broads, I would expect decent toilets and showers, waste disposal, pubs with tables and chairs that aren't minutes from collapsing, a network of attractions, similarly a network of hostels and interconnected footpaths for those on foot or bike, the same for those in boats (especially camping type boats, greater facilities for visiting boats from the continent, high quality alternatives to hostels and burger bars, far more access to the natural Broads, e.g. Hoveton Great Broad. That's just for starters, but largely this should be down to private enterprise. What I don't want to see is a Disney Land approach. It's a fact, that East Anglia doesn't have mountains, tarns, rolling hills and valleys. But that doesn't make it any the less beautiful, just different. Norfolk is not all about the boating, though many would have you believe it is. If you get off the boat occasionally, you'll find there is flora and fauna, unmatched anywhere in the country. Birdwatchers have a saying "Scotland for Golden Eagles and Capercailie, Norfolk for everything else". Norfolk & Suffolk has a wealth of historical sites to visit. More historical finds are uncovered in East Anglia than in any other part of the country. Our coastline, though not 'spectacular' like Cornwall or the Gower Peninsular, has beautiful walks and beaches. From the pines and dunes of Holkham, through desolate open marshes of Blakeney and Cley, to the 'fleshpots' of Gt. Yarmouth (only joking). A serious question here. We all know The Broads is not a National Park, but what area do you perceive is being marketed as "The Broads National Park"? The Broads Authority has a quite small well defined executive area that doesn't cover much away from the actual broads and river themselves. Does "The Broads National Park" as advertised on The National Parks website match this area, or is the perception that "The Broads National Park" covers a far wider area taking in a lot of the villages of Suffolk and Norfolk and the North Norfolk coast? 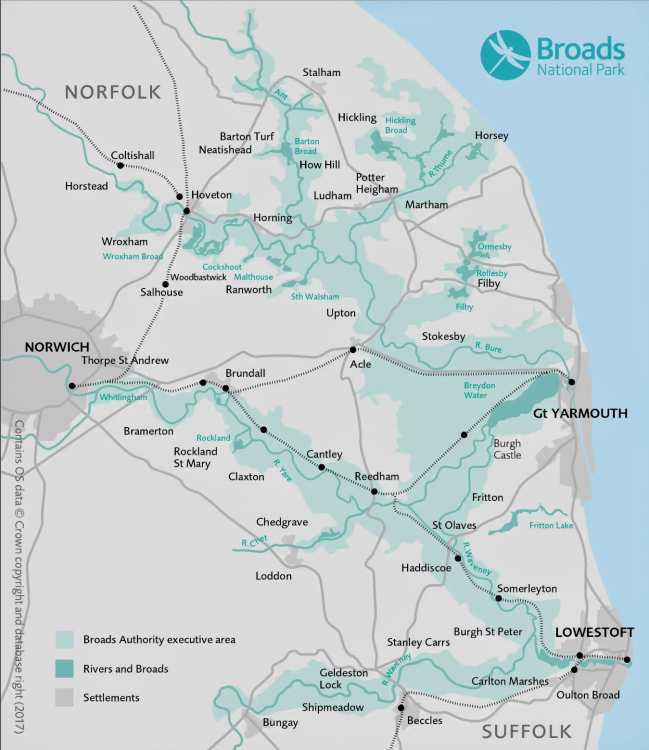 For instance the Bure Valley Railway from Wroxham to Aylsham has very little if any of the railway in the BA's Broads area, but is it in the perceived "National Park"
If the BA are trying to promote The Broads as a National Park, are they inadvertently promoting areas well beyond their defined area of remit? Are they in an overlap situation with North Norfolk District Council? And yet the main Burgh Castle moorings have been left to deteriorate (having been closed) leaving only the Fisherman’s moorings. Quite insufficient for the area. Just one example of neglect. I think that's exactly how the thread reads dnks34, but that does not suit the agenda of some. They don't seem to realise that you can dis the authority without dis'ing the broads themselves. They should do by now, we have enough experts on the subject on this forum. You have, intentionally or not, opened the can of worms. If we can imagine for one moment that the Broads is actually a national park, hard I know, but where is the boundary? I have asked DEFRA, the National Parks people, the BA, the Ordnance Survey and even Google, not one has been able to give me a definitive answer. The BA offered predictable bluster but when push came to shove absolutely nothing definite, except a grudgingly given admission that the Broads was only known as a NP for marketing purposes but that it wasn't one by legislation. Haven got that one straight I'm still no nearer being able to answer East Coast's question! Apart from Norwich I am not aware of any adjacent Authority claiming to be a national park. Perhaps someone else knows better? Whatever, marketing confusion must surely be a fact by now. Where is the mythical Broads national park? Seemingly no one actually knows! In the meantime we have an uncoordinated mish mash of advertisers and tourist boards/authorities, a situation that helps absolutely no one. Just a thought, if the Broads was eventually to become a national park then where should the boundary be? Would there then be an actual Broads National Park Authority or would it be am an amalgam of all the relevant authorities which would also include the Broads Authority? DEFRA has made it absolutely clear that the BA can not call itself the BNP Authority. Your response JM is far better than mine would have been! Am I also correct in thinking that as far as Tourism is concerned the BA have no actual responsibility? The Authority has a responsibility to 'promote the special qualities of the area', which, apparently Packman has taken as carte blanch for a number of activities including being responsible for tourism and the Acle Debacle. I highlighted (b) because this has been seized upon by the authority as carte blanche to be a tourist authority and marketing service for The Broads National Park!!! The can of worms, as was starting this thread, was intentional. The poll illustrates a shortcoming, not in the area, but the authorities insistence on calling the area a National Park. People around the country do not see it as a National Park. Even on this thread people are quoting the special qualities of the area, but which area? North Norfolk, Norfolk, Suffolk, or The BA executive area? 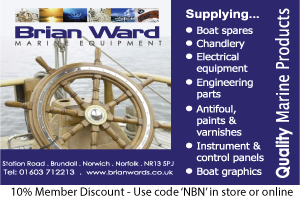 Many of the qualities mentioned on this thread are valid, but not necessarily on The Broads. People should be encouraged to come here for The Broads, not some vague notion it is a National Park. It is this very miss marketing that is likely to lead to people being disappointed and not coming back. 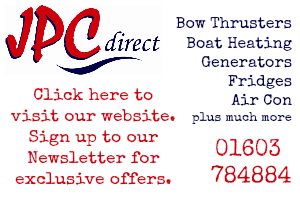 Come here for a boating holiday and enjoy the surroundings and the villages, but to be honest if you are holidaying land based, then you need to see more than just The Broads "National Park" to have a good holiday. 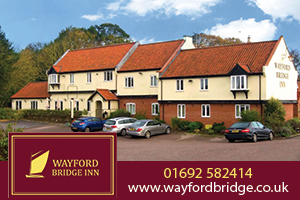 You need to see the wider area, including the North Norfolk coast to happily spend a week shore based. I would actually argue that you might have a better shore based weeks holiday if you stayed outside "The National Park", Sheringham for instance, and visited The Broads for a couple of days out. 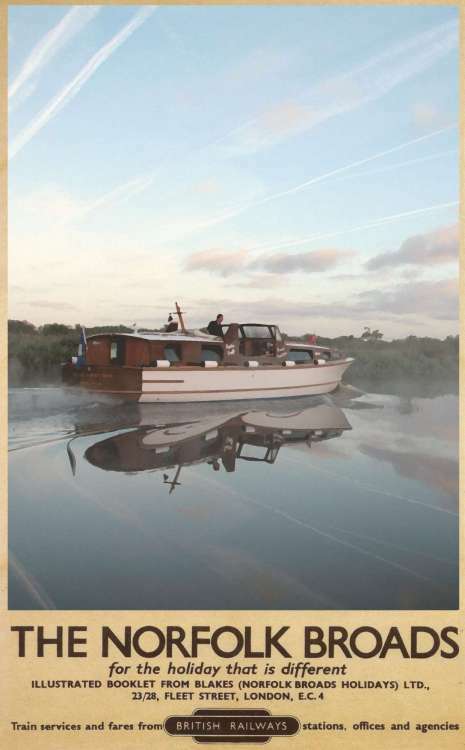 Off course to fully appreciate The Broads and its immediate area, the best way is by boat. 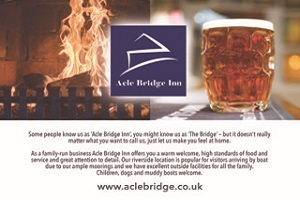 You can leave the car behind and relax with the odd drink and take in all the 125 miles of waterway from the water. 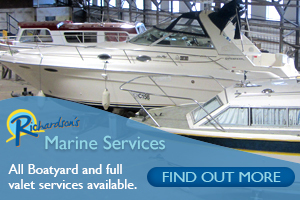 The rest of the BA area you can do with casual strolls from the moorings. Thanks for the correction. Haven't mastered the art of cutting & pasting on this one forum. Off course to fully appreciate The Broads and its immediate area, the best way is by boat. 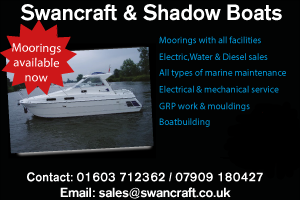 You can leave the car behind and relax with the odd drink and take in all the 150 miles of waterway from the water. The rest of the BA area you can do with casual strolls from the moorings. Spot on, exactly right, in my humble opinion! Whilst I can cut and paste, the wording was taken from a scanned copy of The Norfolk and Suffolk Broads Act 1988 and had to be typed word for word. Neither here nor there really. 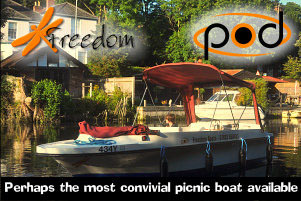 However it does state promoting the enjoyment of The Broads, not The Broads National Park. A quick Bing search of broads posters images reveals the following, many of which are iconic images we all associate as The Broads. The BA would do well to go back to a similar marketing campaign and spend money on that, rather than this miss-guided notion of being a National Park. The link is only a search, so contains some images not related to The Broads, but you'll get the idea. Something oddly familiar about one of those posters! This year's Green Book made good use of those posters on its cover. Hopefully it will suffer a critical erectile dysfunction during its attempted conception! To travel the NP, will I am afraid be a bit like doing the Okey Cokey, you will be in and out like a fiddlers elbow unless on the waterways. Herewith the BA's mapping. I have to say I find the West Somerton, Horsey, Waxham area interesting, reaching the coast and extending the whole length of the New Cut Drain. PS. 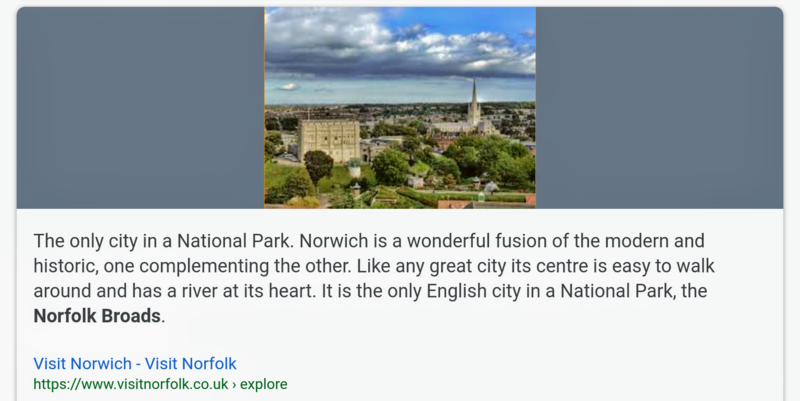 Does not indicate that Norwich is a city in a National Park as I have seen stated. However Norwich thinks it is in a National Park, or at least Visit Norfolk does. Its just a shame that Norwich and The BA don't celebrate the river that's at its heart! Looking at that map then, The BA executive area really is just the rivers and Broads and the marshlands that surround them. I too am surprised at the extension all the way out to Horsey beach. However unless you want to do the Okey Cokey as Chris suggested, you really do need to be on a boat to see and stay predominantly in The Broads area. I just hope that Packman doesn't decide to put a welcome to The Broads National Park sign on each road as it enters and exits The Executive area. Don't think the budget will stretch to that many signs. There'll be a national steel shortage. Personally I think British Railways did a far better job of advertising the area than that shower based in Norwich. Which is another thing, why is The Broads Authority office, outside of its executive area? Sorry "National Park"
I wonder if the Horsey Beach and New Cut Drain was under a Drainage Board who's responsibilities were transfered to the BA in some way. It is a complicated area of BA, National Trust and Horsey Estate Trust. As far as I can see, the only reason people would want these borders defined is so they can use them to further bash the BA. In all fairness I'd be happier if those borders were vague and far from defined in any way. That is the whole thing. There is no boundary because The National Park exists in name only for promotional purpose. So it begs the question why not include the North Norfolk Coast and saltmarsh etc etc. It only becomes important should the area gain full NP status because it then directly impacts on people who live and work within. Whilst property within a NP tends to out perform other areas from a wealth generation perspective, there are downsides to living in one. Funny the way this thread has gone! I was the first to respond to the OP. I did so to defend The Broads from a survey it did not have a hope in hell of doing well in. Funny how people read into things! Unless I'm very much mistaken that was the work of Strowager. Wonder if Griff will be the poster boy for "The Broads National Park"